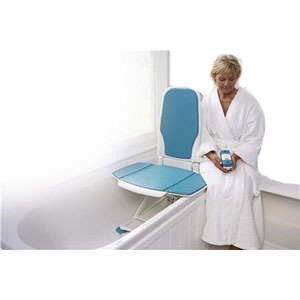 Average amount of bathlifts per charge will be between 8-10. Also depends on the weight of the user and how many times during a week it would be used. Recline does not occur automatically like other lifts, but is entirely controlled by the user after the lift has completed its descent. The user can select any angle of recline up to 40° to achieve the most comfortable and suitable position for themselves. An automatic sleep facility occurs after 10 minutes of non-use in order to optimize battery performance. Reactivate simply by pressing a control pad. 5 year warranty on frame, 2 years on motor/actuator hand controller, recharger, and cover.